Fifteen in total, the Hiroshima Panels are monumental, folding wood panels completed by Japanese couple Iri and Toshi Maruki over a span of 32 years, from 1950 to 1982. In a classic byobu format, vacillating between photographic realness and abstraction, the panels complicate, challenge, and deepen common perceptions of the nuclear bombing and its aftermath. 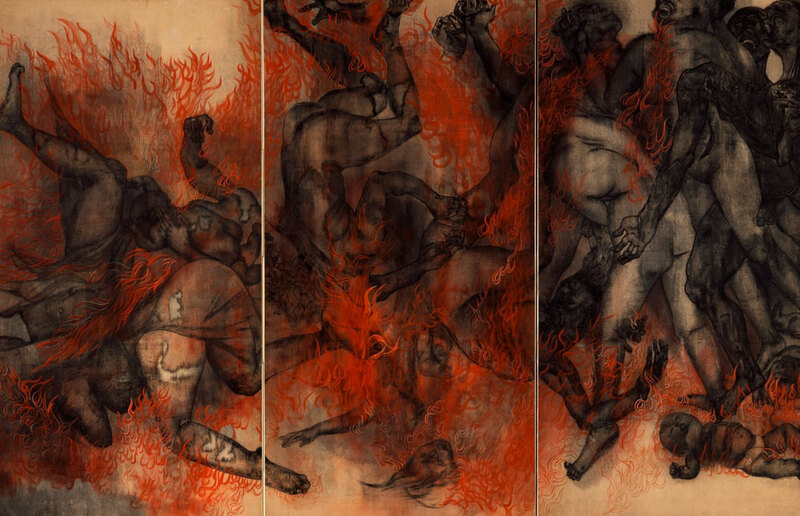 Six panels from the series will be on display at Pioneer Works including Petition (1955), Floating Lanterns (1968), Ghost (1950), Fire (1950), Death of American Prisoners of War (1971), and Crows (1972). The exhibition is at the center of a series of programs at Pioneer Works that explore the discourse between art and trauma. Pioneer Works thanks Kathleen Sullivan, PhD, and Robert Croonquist of Hibakusha Stories for their support in the organization of the exhibition and related programming. This exhibition was organized by Gabriel Florenz.